Discover the largest and most varied middle-market portfolio in the industry. We ensure that every privately-held business we work with is buyer ready, complete with the most detailed and extensive documentation available and represented by some of the most experienced and capable dealmakers in the industry. Our clients represent a diverse selection of opportunities from almost every industry in North America. To explore our available inventory, please access our dedicated buyer-focused enterprise, DealForce, using the link below. Evaluate a potential acquisition like never before with the most detailed Offering Memorandum in Middle Market M&A. Our evaluation teams pride themselves on a painstakingly in-depth approach to company valuations and the comprehensive documentation that follows as a result. We believe in providing you with all of the information you need and more, first time and every time. 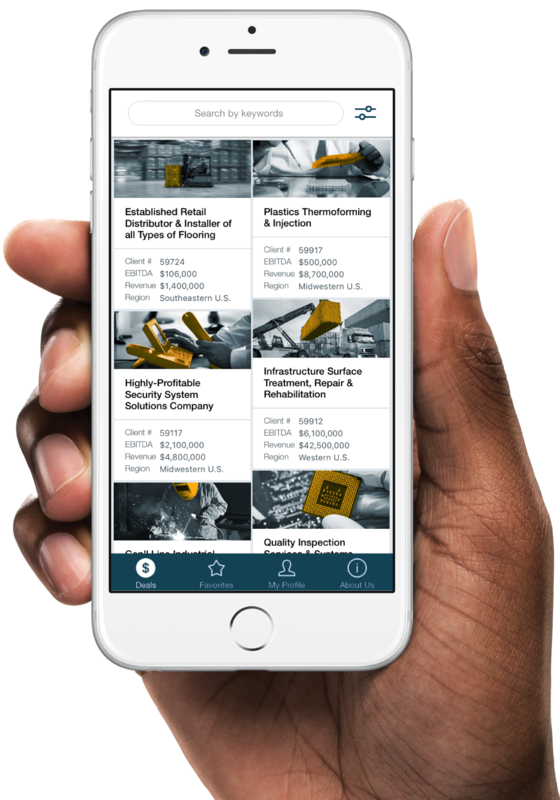 For the first time in M&A history, our buyers can now search for their ideal acquisition whenever they want and wherever they are with our innovative new app, DealForce. Accessed for free via the App Store, DealForce provides the top-level information of every business we represent and lets you request a copy of the full Offering Memorandum without leaving the app.